This guide contains the information you need to get started using your Polycom® SoundPoint® IP 550 and 560 phones with the AT&T CollaborateSM service. You’ll learn how to access features using the buttons, line keys, and soft keys on your Internet Protocol (IP) phone. For more detailed information about using these phones, see the Polycom SoundPoint IP 550 or Polycom SoundPoint IP 560 User Guide, available from Polycom. Note that not all Polycom SoundPoint IP 550 and Polycom SoundPoint IP 560 features are available with Collaborate. For reference, print this page and fill in the important information your administrator provides. The Polycom SoundPoint IP 550 and 560 have 4 phone lines. The phones have standard phone keypads and a few additional buttons (for example, Messages, Hold, and Redial). The phones also have soft keys, located below the display window. Soft keys work like other phone buttons or keys, but the function of each soft key can change. A label appears in the display window, defining each soft key’s function at a given time. In this guide, we refer to soft keys by the label that appears in the display window describing the function of the soft key at a particular time. Your organization determines which Collaborate features you can use and can also impose dialing restrictions. If you have questions about the features available to you or about any dialing restrictions, check with your administrator. 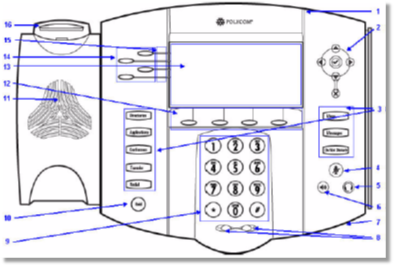 Use these keys and buttons on your Polycom SoundPoint 550 or 560 phone. If you have already picked up the hand set (you already have a dial tone), and then enter the numbers to place a call, the call connects automatically after a few seconds. Press Headset (if you’ve connected an optional headset). Pick up the handset and enter the number you want to call. Press a line key and enter the number you want to call. Press the New Call soft key and enter the number you want to call. Press Speakerphone or Headset and enter the number you want to call. To reach people at other sites, you may have to enter the site prefix plus the extension. For more information, see the AT&T International Dialing Guide at https://www.business.att.com/bt/dial_guide.jsp. A list of received calls appears in the display window with the most recent call listed first. Scroll to the number you want to call, and then press a line key. The Placed Calls list appears in the display window. Scroll to select the number you want, and then press a line key. To put a call on hold, press Hold. To resume the call, press Resume. The special features of Collaborate described below can save you time. Note that if this IP phone is located in a conference room and not assigned to an individual user, some features meant for individuals might not be available. Press a button (Speakerphone, Headset). Manage calls with these special calling features from Collaborate. If you see a new caller’s ID in your phone’s display window while you’re on a call, Call Waiting is turned on and you have an incoming call. Enter *70 and the number you want to call. Optional—You can enter a feature access code followed by the account code when calling outside your organization. Or, your administrator can block your line’s caller ID for all calls. Enter *67 and the number you want to call. Enter *65 and the number you want to call. Enter *31, and then pick up the handset. Enter #31, and then pick up the handset. During a call, press Transfer. Press the Blind soft key and enter the phone number to which the call will be transferred. The call is transferred and you’re dropped from the call. If the person agrees to accept the call, press Transfer again. The call is then transferred from your phone. If the person isn’t available or doesn’t want to accept the transferred call, press Cancel to resume the original call. After the first person answers, press the Confrnc soft key. This places the call on hold. If the person wants to join the call, press the Confrnc soft key to establish the conference. If the person doesn’t want to join the call, press the Cancel soft key to drop the second call and return to the first call. If you don’t want to answer a call while it’s ringing, you can reject the call. If you have voicemail, the call is then routed to your voicemail. If you don’t have voicemail, the call is routed to your chosen “when I don’t answer” call treatment. Note: If the ringing line is a shared line, your phone will stop ringing, but the shared lines will continue to ring on other phones. While your phone is ringing, press the Reject or Silence soft key. appearance. The line keys on your phone can have repeated numbers, different numbers that belong to you, or numbers that belong to others. When a call comes in to a number, all phones with that number as a line appearance ring at the same time. When the call is answered, how it’s handled depends on the line’s call presence. While on a call, press the line key associated with another line. The call on the first line is put on hold. To return to the first caller, press the line key associated with the first call. The second call is automatically put on hold. Call Forwarding – Not Reachable—Applies when your phone can’t be reached by the Collaborate network (not simply when you don’t answer or are busy). You can set it up in advance. Note: Your administrator establishes your access to call forwarding features. If you have questions about your access to these features, check with your administrator. *72 for Call Forwarding – Always. *92 for Call Forwarding – No Answer. *62 for Call Forwarding – Busy. *94 for Call Forwarding – Not Reachable. Press a line key. A voice prompt confirms that call forwarding is turned on. *73 for Call Forwarding – Always. *93 for Call Forwarding – No Answer. *63 for Call Forwarding – Busy. *95 for Call Forwarding – Not Reachable. Press a line key. A voice prompt confirms that call forwarding is turned off. There will be times when you must reset your phone so that it can retrieve crucial software updates and configurations from the Collaborate service. Select Settings, and then press the Select soft key. Select Restart Phone. The Polycom logo appears in the display window for a short time. When the logo disappears, the phone is again operational. Lights on the Polycom SoundPoint IP 550 and 560 phones indicate whether a line is ringing, busy, active, or on hold. Solid green An active call is in progress (appears on the phone with the active call). Fast flashing green The call is held by the other party (appears on the phone with the active call). Flashing green The call is held by the other party (appears on the phone with the active call). Flashing red The call is on hold (appears on all shared lines and devices). Solid red The line is busy remotely (on shared lines).